Carleen Maley Hutchins (May 24, 1911-August 7, 2009) started making her first musical instrument, a viola, when she was 35, motivated by an intense desire to play chamber music with friends, coupled with a practical need to stay at home to care for her first-born child. Little could the former grade-school science teacher have anticipated that her new hobby would forever change the direction of her life. Hutchins' long and distinguished career--as founder of the New Violin Family Association, creator-in-chief of the Violin Octet, co-founder of the Catgut Acoustical Society, author of more than 100 technical publications, editor of two volumes of collected papers in violin acoustics, four grants from the Martha Baird Rockefeller Fund for Music, recipient of two Guggenheim Fellowships, an Honorary Fellowship from the Acoustical Society of America (the Society's highest award, bestowed only sixteen times; the first of which was to Thomas Alva Edison), and four Honorary Doctorates--remains a tribute to her insatiable scientific curiosity and no-holds-barred attitude. 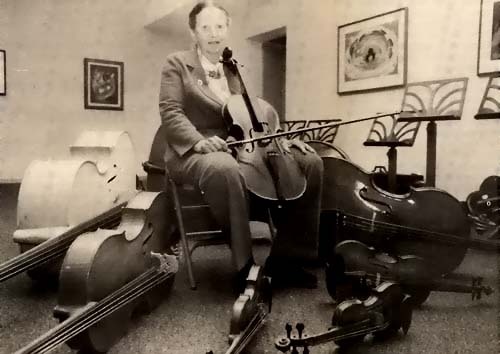 Violin maker/researcher, Carleen Hutchins, surrounded by the NMM's violin octet during the annual meetings of the Catgut Acoustical Society and Guild of American Luthiers, held at the NMM in June 1992. Photograph courtesy of the Yankton Press & Dakotan. Hutchins is best known for her creation of the violin octet, a set of violins in various sizes reminiscent of the Renaissance consort and the 19th-century experiments of Adolphe Sax (1814-1894) who focused on creating a homogeneity of sound in his saxhorn and saxophone families. Hutchins achieved similar results with her eight acoustically adjusted violin sizes, ranging from a treble violin (about the size of a quarter-size violin) to a giant, seven-foot-tall contrabass. The impetus for the development of the violin octet came in the form of a challenge posed to Hutchins in 1957 by the noted American composer of acoustically spatial music, Henry Brant (b. 1913), then a composition professor at Vermont's Bennington College. Brant's original vision of a set of "seven graduated-size" stringed instruments was slightly modified by Hutchins, who later noted that "it took me seven years to achieve the first complete set which consisted of adapted and specially-constructed instruments." Subsequently, Hutchins was personally involved in the production and/or supervision of more than 100 instruments of the violin octet family. From this pool, several complete octets were assembled, with one each placed at the NMM, the Musik Museet in Stockholm, the Edinburgh University Collection of Historic Musical Instruments, and the Metropolitan Museum of Art. Currently, the Southern California-based Hutchins Consort is the only professional ensemble currently performing on the octet. When asked what the future might hold for the violin octet, Hutchins was hopeful. "They still need to be explored in depth and played seriously by a group of dedicated musicians who will give them the same treatment that is given to learning any stringed instrument." Right: NMM 10181. Viola by Carleen Hutchins, Montclair, New Jersey, 1953. One of three flat-topped violas on which Hutchins and Frederick A. Saunders performed more than 100 experiments, including the acoustical role of purfling grooves, sound hole size, bridge materials, and bass bar placement. Soon after Hutchins completed her first viola in 1949, she was introduced to Frederick A. Saunders (1875-1963), a Harvard physicist and amateur chamber musician who had been conducting research concerning violin acoustics since the early 1930s and who was destined to become Hutchins' mentor. The pair subsequently conducted seminal research using experimental instruments of Hutchins' manufacture. Interviewed in 1993 by Paul R. Laird, University of Kansas musicologist, Hutchins noted that one of her first experimental violas (NMM 10181) "was the most important instrument I ever made because we did at least 100 experiments, maybe more, on it and learned an awful lot that has proved quite valid ever since." Resembling a viola turned inside out, with its bass bar prominently placed on the exterior, the instrument's odd-looking flat plates facilitated sound post repositioning. The viola's "spiral-nebulae shaped" sound holes, originally quite small, were progressively enlarged by Saunders as their collaborative acoustical experiments proceeded. Left: NMM 10116. Violin, Le Gruy�re by Carleen Hutchins, in consultation with Edgar A. G. Shaw and Arthur H. Benade, Montclair, December 1982. Sixty-five holes in the ribs were alternately plugged and unplugged with corks and pieces of foam in experiments to test the interior cavity resonances of violins. Nicknamed Le Gruy�re and the Swiss cheese violin at the 11th International Congress on Acoustics, Paris, 1983. Following the completion of her first instrument, Hutchins personally built more than 75 violins, 165 violas, and 12 violoncelli, consecutively numbering them all after her "SUS" (Latin, for swine) system, established in honor of a special pig named Susie Snowwhite, once a fixture in Hutchins' science classroom at New York's Brearley School on the Upper East Side of Manhattan. Hutchins' handwritten workshop notes for all of her octet instruments figure prominently among the extensive Hutchins' Archives preserved at the NMM. Gabriel Weinreich, professor of physics and noted acoustical researcher at the University of Michigan, whose experiments have included extensive work with Hutchins' Swiss-cheese violin (NMM 10116), succinctly characterized his impressions of Hutchins at a 1991 meeting of the Acoustical Society of America, noting that she has "No respect for authority; a long attention span; scrupulous honesty; enthusiasm for intellectual collaboration; and the willingness to spend a lifetime beating a path through the jungle." Working well into her 90s, Hutchins' indomitable spirit and drive were by no means diminished as she continued aggressively to pursue her research focusing upon the further development and refinement of the instruments of the violin family. Excerpted from: Margaret Downie Banks, "Graphite, Gruy�re, and a Pig named Susie . . . Carleen Hutchins' Instruments and Archives Donated to the Museum," National Music Museum Newsletter, Vol. 30, No. 1 (February 2003), pp. 4-5.